Gluten Free At The Cup! The Coffee Cup Café is a very gluten free friendly restaurant. We do not have special sections or markers on our menu because almost everything already is gluten free or can be made gluten free. All of our cooking oils are gluten free, and we make fresh-cut French fries and country fries in-house that are free of additives other then spicing. All of our sauces and dressings are gluten free. Breaded meats and sausage gravy are the only items that cannot be made gluten free. 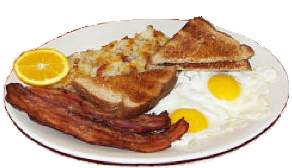 We offer gluten free tortillas, whole grain bread, burger buns, green chili, hollandaise sauce, pancakes and French toast. We do charge an additional 75¢ for substituting gluten free bread, tortillas, burger buns, and pancakes. The additional charge is simply to try and offset the additional cost of those items.